Even after the northern boundary between North Carolina and South Carolina was established in 1772, the settlers still referred to the area along the border as Craven County. It was not until after the American Revolutionary War that the settlers gave up the use of the title, admitted that they were a part of Pinckney District and recognized Pinckneyville as their center of government. By 1791, there were significant enough numbers of white settlers in the previously-held Cherokee lands that the new state of South Carolina finally decided to officially recognize that these settlements were going to need state and local governmental supervision. In that year, two new Districts were created in the northwestern section of South Carolina - the Pinckney District and the Washington District. Each had District Seats designated with courts established in those seats. York, Chester, Spartanburg, and Union Counties were joined to form a District Court which was known as Pinckney District Court, held in Pinckneyville, on the southwest side of the Broad River in eastern Union County. Pinckneyville had a court house and jail. Equity court cases affecting York County came under the Camden District and were held in Columbia. In 1800, the Pinckney District was abolished and York, Spartanburg, Union, and Chester became separate districts (counties). "Be it therefore enacted by the honorable the Senate and House of Representatives, met and sitting in General Assembly, and by the authority of the same, That the place or village on the southwest side of Broad River, below and within one mile of the mouth of Pacolet River, being the situation wherein the gaol and court house of the said district have been built by the commissioners appointed for that purpose, shall be called Pinckneyville, and by that name shall always be known in law...." (Enacted by the South Carolina legislature on December 21, 1792). Pinckneyville, named for Revolutionary War hero Colonel Charles Cotesworth Pinckney, was established in present-day Union County as a circuit court to serve Union, Spartanburg, Chester, and York counties as a general sessions and common pleas court. At the time the law was passed the court house had been started but was unfinished. In spite of the hardship, the judge had already held court in November of 1792 at Pinckneyville. The district lasted until 1800 when, because of population growth, each of the state's 28 counties was given its own district court (at the same time York County became York District). The town of Pinckneyville, which lay on the stagecoach route from Philadelphia to Charleston (locally called the Yorkville to Chesterville Road), lasted until around 1850 when railroad traffic siphoned away the old ferry traffic. 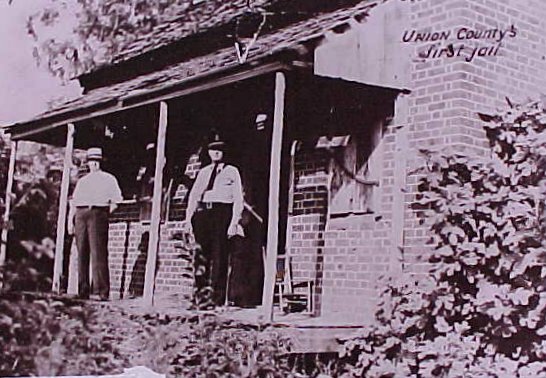 Pinckneyville was granted a U.S. Post Office on October 1, 1795, and its first Postmaster was Mr. Hugh White. On October 13, 1874, this Post Office was permanently closed.